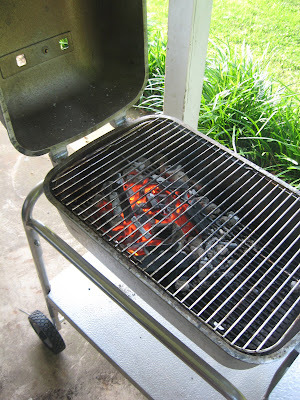 I've written about my Dad's great old grill and how it's still going strong years later. I really don't know when he got it or where. 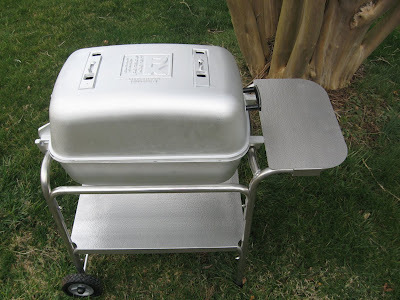 We just grew up with the PK cast aluminum grill, so I'd say it must be 35 to 40 years old. I didn't think they "made them like they used to," and they didn't. Portable Kitchen was off the market for a long time. Then, Paul and Sarah James got tired of the poor quality grills and shopped yard sales and found an old PK grill. The James family decided that there were people out there who did want to invest in quality instead of buying a new grill every year, so they talked to Meigs family and worked it out to put the PK grill back on the market. My new Portable Kitchen grill above is the Sportsman model. My Dad's PK is called Executive and is a little bigger with the hinges on the back rather than the side. Otherwise the grills are alike other than the old one has mellowed to a dark gray and black with loads of use over the years. Cast aluminum means that the grills are made in one big piece. When new and out of the stand, they look kind of like huge tin foiled wrapped baked potatoes. While most grills are made of thin grade metal, the PKs are thick and heavy. Like cast iron, they retain the heat. But, they don't rust like cast iron. Yippee! That's a huge problem with most grills, and even my Dad's ancient PK grill shows no signs of rust. With the heat retention and with wider grates, you can sear nicely on the PK grills and can also close the lid and adjust the dampers to smoke meats. Portable Kitchen grills really crank once they get going, so below you will see how I offset for dinner last night. Offsetting the coals means just burning on one side. That gives me room to sear the steaks but a cooler area to finish them off and also to work on the side dishes. This is the same set up you'd use to smoke meats on the Portable Kitchen grill, but you'd close the lid and have the vents closed most of the way. 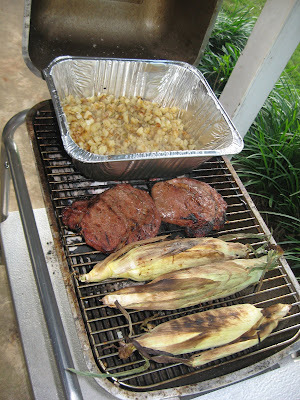 Our dinner last night included rib eye steaks, grilled corn on the cob, and grilled hash browns and also Texas Toast which we put on right at the end, since it doesn't take much time at all to heat bread on a grill. 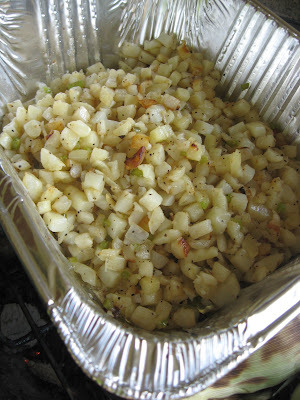 The hash browned potatoes went on early to get started, but we do start out with tin foil on top. They are basically steamed on the grill. The boys love them, so we do those pretty often. We then put the marinated steak on the hot side of the grill to sear and had the grilled corn on the cob on the cooler end of the grill. Those were rotated once the steaks were seared on the outside and then finished off to medium. It's hard to beat a PK. Portable Kitchen is one of the best charcoal grills on the market. I'm glad they brought it back. Nice to see that the new PK's are like the originals. Nice looking Ribeyes! Yes. The PK grills are made the old fashioned way. Very impressive. I have one of the old ones and my dad does as well. They are the best I have a grate and grill coming for mine tomorrow. I have used mine a lot. I am thinking of trying to fix a roast sometime. Thanks for posting your story. My father bought one in 1964. My mother was furious. $60.00 was a lot of money in those days. 46 years later he is still using it. I bought on of the new ones 6 years ago. Expensive in today's dollars,but well worth it the first time I used it. The kid at the hardware store told me I could get a good gas grill for about the same price. I told him that I had never heard anyone rave about "that great gas flavor". Then I asked him if any of those other grills would last 41 years (at the time). He said no. His mouth dropped open when I took it apart in less than a minute to load into my car. He shut up. My wife says that I have to teach the kids how to "smoke" a Thanksgiving turkey (with apple wood) on the PK before I die so that she won't have to learn how to cook a turkey ( she's never had to). Well my diet's ruined; I saw the steaks on the barbq and just had to go for it. They look stunning! That's a hard question. There are benefits to both types of charcoal. I prefer briquettes - Kingsford. I grew up on those, and I love the taste. You get a different flavor with natural lump charcoal. It is more like wood smoke grilling. Natural lump does burn hotter and leaves less ash, so that's good. But, for flavor, I stick with briquettes most of the time. I do use natural lump in the Big Green Egg as recommended. It looks great. I inherited my PK this summer. Got the new grill and grate and just cooked my first dinner on it last night. My PK is a few months older than me. My dad worked at Woolco in Oklahoma City and got it on the after season sale for $25 in 1972. What a great buy. Now in it's 38th year of use and The only rust is from the wingnuts on the frame. My wife has been to Sam's Club and stocked up on grilling meat for the rest of the summer. I plan on passing this PK grill on to my son in another 30 years. Reclaimed my dad's PK Grill yesterday with new grates. Did a major cleanup put in the new grates fired it up, cooked sirloin kabobs, and a chickin. Wow! what at treat. Now I know why my dad loved it so much. We got it in the mid 60's and it is now back in service. Several of my friends have the PK that was part of the family and glad it inspired me to recover mine. Hey, having a major problem here, trying to decide between a BGE and the PK. I know, its like apples and oranges so to speak, but if you have to choose one.. which one would you choose. 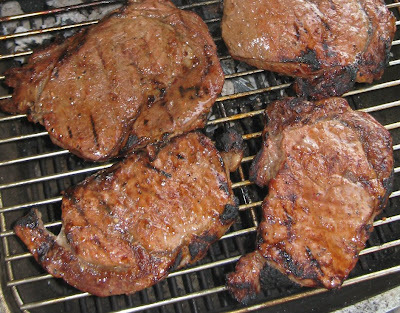 I love grilling, have gas and a charcoal grill but its large and uses alot of charcoal, want something good for grilling for me and my wife (empty nesters) and I can't seem to make up my mind. The charcoal grill is rusting away and the gas grill, well, I have already rebuilt it once and its about down again. Please help! Let me say first that I don't think that you could go wrong with either the PK grill Portable Kitchen or the Big Green Egg. Both are excellent products. When I consider what I recommend, I look at the person or family. There is not one grill that is the best for all situations. From what you've shared here, I am thinking that you might want to go PK. As empty nesters, the PK is a good size and the cost is lower. You can do the traditional open top grilling which I love for the steaks and burgers versus closed top which is more like baking but with smoke flavor. BGE is closed lid. The food does come out nice and moist but not the old fashioned grilled style with charcoal like Kingsford and with that same flavor. If you are doing more smoking rather than grilling, then BGE is rocks on that, and you can get more recipes and tips online to smoke on BGE. But, it does not take a lot of time to master smoking with the PK. It's just venting the grill and going offset on the charcoal. The Portable Kitchen holds heat real well, so it is real good on smoking but not huge amounts at one time. Hit me on email if I can help out more. Both the grills/smokers are excellent. I think you'd be happy with either, but I'm thinking PK in this case. I've heard of the orange PK grill model you have, but I've not seen one. My guess is that it was a special run and likely sized and cast from one of the main patterns. The current model is the Sportsman. At the moment, that is the one they are making and selling. My Dad's old PK cooker was the Executive. It's boxier looking, and the hinges are at the back rather than on the end. It's a smaller model - the new one. I would encourage you to contact the company. It is family owned. They are really helpful. They would know about the replacement parts and what fits which model. You sure got a great find to get a PK at the thrift store. They are wonderful grills/smokers.